Free Wordpress plugin that allows Matterport Spaces to be embedded quickly and easily with a [matterport] shortcode. 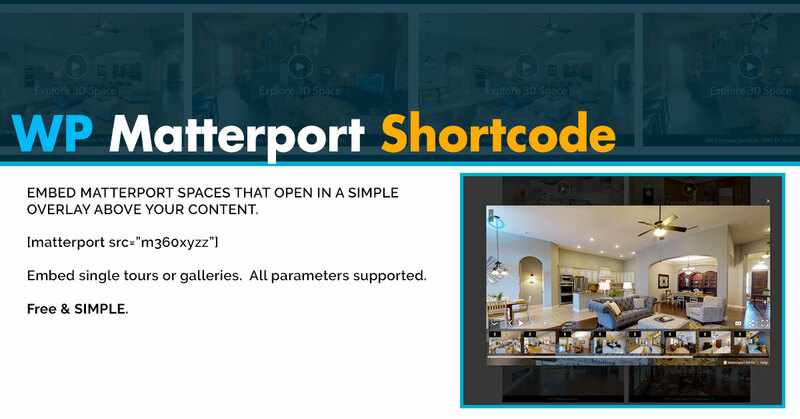 WP Matterport Shortcode is a free, open source plugin that allows anyone with a Wordpress site to quickly embed Matterport tours anywhere in their site. The [matterport] shortcode will display the start image for a tour with a label. When clicked, the tour will appear in a large overlay above your site's content, giving viewers a very large viewing area without compromising your website's design. You can easily add multiple tours to build a gallery with 1, 2, 3 or 4 columns, which is perfect for a portfolio site. All Matterport parameters are supported!